Yes, we refuel frequently. But, in a world where the phone can ring at any minute and a disembodied voice order you to the other side of the world, it's best to keep the tanks topped off. So, here are some pictures of today's Fueling at Sea, and some of what passes for scenery while we're underway. 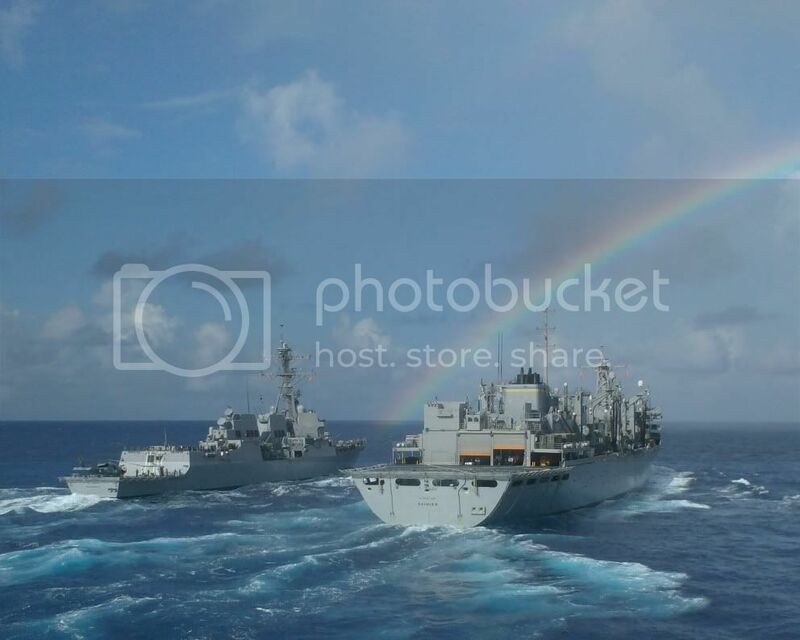 No pot of gold at the end of this rainbow, but USS MOMSEN and USNS RAINIER look sterling. Greyhounds on the horizon. 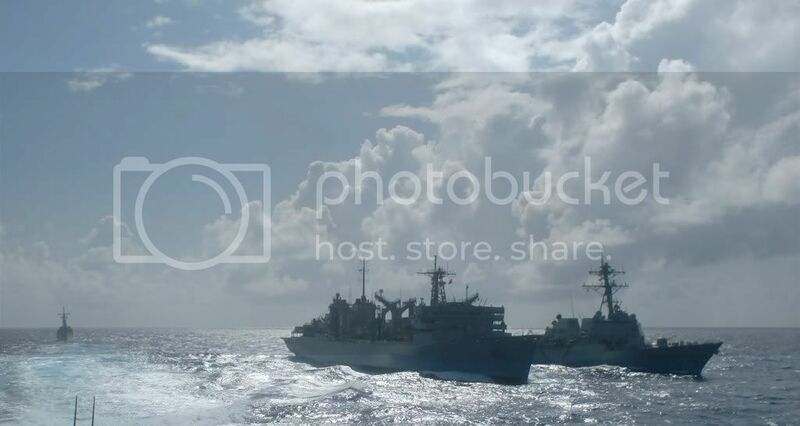 From left to right, USS CURTS, USNS RAINIER and USS MOMSEN. RUSSELL pulls away from RAINIER and MOMSEN while CURTS prepares to make her approach. This is a very neat website. I just sumbled upon it today. Deffinitely will gonna show my parents. I heard a rumor that smoking was secured while this evolution was in progress throughout the ship (note: I'm a sub guy, so refueling is not done very often). How does that impact the morale of your men who chose to indulge their addictions with smoking? Thanks, sir! Rule no. 1 in rainbow photography: There has to be something useful in the photo along with the rainbow. A lot of people ignore that rule. RAINIER BM2 to BM3: "Ten bucks if you can hit the helo with the shot line". The "smoking lamp" is extinguished while we're refueling, and no matter what, there are always a few grumblers. Most Sailors, however, are smart enough to realize it's a bad idea to smoke when you're receiving fuel at a rate measured in thousands of gallons per minute. Also we usually can complete the evolution withing the time most of us have for a lunch break, so it's really not an issue. 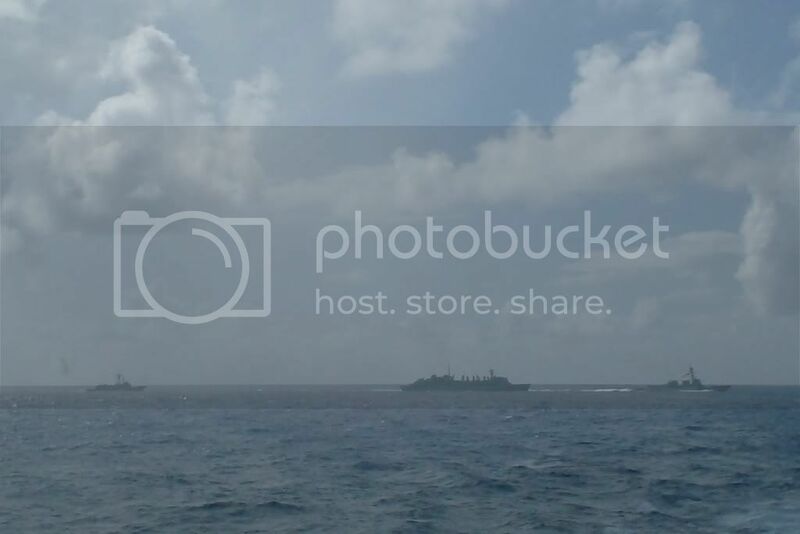 As for the .mil restrictions on photobucket, I usually try to use Blogger for the photos. But with the limited bandwidth we have dedicated to web browsing, some times the java upload applet won't load in Blogger. Also, if you check out our mission statement, browsers in the .mil domain aren't really our target audience, either. Hey, XO - great pics! Especially those of my old ship, "The Lucky Swede". Keep up the great work and sail safe. XO, thanks for the photos.. and I sure miss my old ship the Momsen..
XO, those are some great photos. I have several more if you would like them.